I'm back, back, back again! School is over and this means I actually have a few seconds of free time to catch my breath and get back into blogging! Hooray! I'm going to post some more posts to update you on the last few weeks of my semester, as well as my summer plans (!!) so be on the lookout for that! 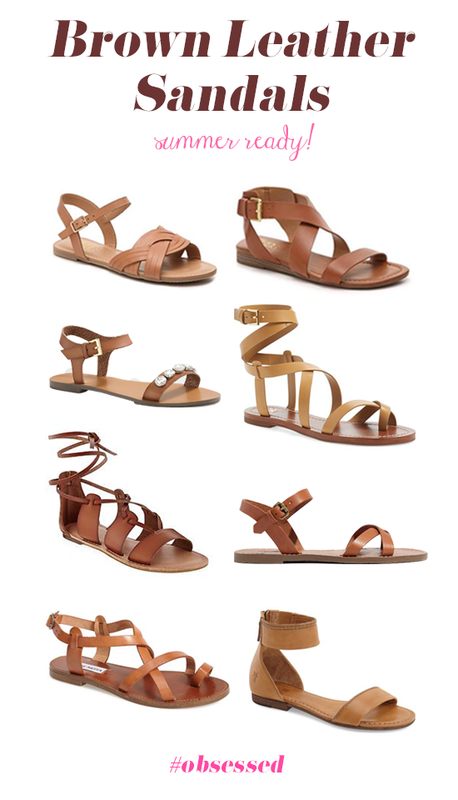 Brown leather sandals seem to be "The Summer Shoe" this year. And I'm definitely not complaining. Brown has always been my neutral of choice and brown sandals have always been a summer staple in my wardrobe (I've gone through 2 of these pairs). Last Summer while living in Paris, this pair of brown sandals were worn almost every day. I was on my second pair of my trusty, strappy brown sandals when I was walking down a Parisian street to meet a friend for dinner and my shoe completely broke! Right in the middle of the street! Luckily, there was a Forever 21 right across the street so I was able to go in and buy a super cheap pair of sandals so I had shoes to wear that night! So glad to have you back, and I can't wait to hear more about your future plans! I'm also a sucker for brown leather sandals--I get a new pair almost every year! Love these picks! I love brown leather sandals because they're so versatile, they literally match with everything! I live in my brown sandals during the summer! I like the idea of wearing pointed bellies and attractive looking wedges while going out for parties, but I don’t feel comfortable in them. Nothing feels as stylish and comfortable to me as Greek sandals, and I can wear them in routine. Leather sandals are perfect for the men and women that participate in outdoor activities such as hiking, or taking extended walks in the warm weather. Gladiator sandals leather, and sandals brown leather are both optimal due to the fact that they are constructed of a leather material. They have thicker soles that provide a much stronger traction level that the traditional sandal.I find this website for brown walking shoes.